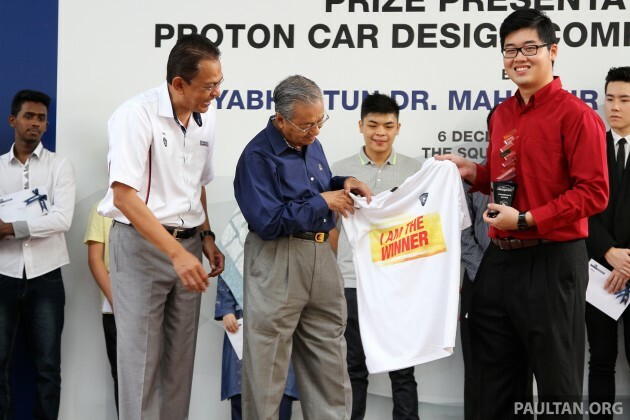 The Proton Design Competition 2014 has officially come to an end – the two category winners of the contest were announced at an event that also saw the introduction of the Suprima S Standard. In Category 1 (for secondary students aged 13-17), 17-year-old Muhammed Amiruddin Abu Bakar walked away with the first prize, while in Category 2, for college students/individuals within the ages of 18-25, Pow Ying Hern emerged champion. Amiruddin, a SPM-level student at SMK Taman Melawati in Kuala Lumpur, took home a MacBook Air and RM3,000 in cash. The first and second runner-ups also won a MacBook Air each and RM2,000 and RM1,500 respectively. Seven consolation prize winners received RM500 each. Twenty-five-year old Pow, a degree holder in Product Design from Nanyang Technological University in Singapore as well as a master’s certificate holder in car design from Domus Academy in Milan, Italy, won a MacBook Pro and RM5,000 in cash for his winning entry, called e-Luma. He also won the Chairman’s Award, which bagged him a special trophy and an internship with the Proton Design Studio. The first and second runner-ups in Category 2 won a MacBook Pro and RM3,000 and RM2,000 in cash respectively, and seven consolation prize winners each won RM1,000. The contest, which began in June, saw a total of 337 entries from both categories. Category 1, open to entrants aged 13 to 17 years old, contained 158 submissions, while Category 2, open to those aged 18 to 25 years old, received 179 submissions. Group entries were not allowed, and only Malaysians with a valid Malaysian identity card could participate. Two rounds of shortlisting were held on September 12 and 15, whittling the entries down to 58 in total – 36 for Category 1 and 22 for Category 2. This was eventually brought down to the 10 best entries for each category, with a final round of judging determining the winners. In addition, entrants had to submit a written proposal detailing their car’s design concept, unique selling proposition and proposed powertrain system. Given that this was first and foremost a design competition, submissions were naturally judged on their aesthetics and presentation, but specific emphasis were given to the originality and innovation of the designs. and who the F are you ? All good designers don’t want to work here lah. They all go Singapore or Thailand to work. Malaysia pay is so small and promotion not guaranteed. Work so hard also, one fellow, just because he was born into the privileged, get promoted. You a designer ? If not, shut up. If yes, you can surrender your passport and leave the country. When the parrot start asking people to surrender passport and leave the country, the monkeys think Malaysia is their own zoo and playground. Watching too much Planet of the Ape?? #Protonist, you high on cow dung or infested by monkey fleas ? so the consequences are? they dont work here because the pay was low, citizen only think about themselves, but dont care about the country, then in someday, these people blaming the country is so lauyah, but they forgot they left it. WELL PLAYED GENIUS. Car design have nothing to do with religion.Well known car maker are all non muslim.By the way,all you intacted muslim with ‘Kulup’? I sincerely hope that you will not drag religion into this matter. Please. Seriously. Singapore designer vs. Cartoon car designers. Hmm.. Obviously sarcastic tone with unparalleled stupidity yet intelligently using other pupil identity to tarnish others. hei datuk rani,siapa ajar aa nak pakai kreta kena pakai designer muslim dlm bab muamalah kata harus la..genius….think before you shame your own religion aaa.. n by the way why kulup kulum knapa tk pgng tasbih ke..much better..
Perodua designers sorry la… No competitions for you guys..
Perodua is a cetak rompak company… just cut and paste…. Proton Accord also no value added to the nation. Kasi malu Honda Japan saja. When you have nothing constructive/informative to say, you insult ppl. Indirectly you also agree with me on the gap between Toyota and Proton. Thank you. At almost 90 he still takes the time to attend events that are considered miniscule to his statesman status. I pray I have the strength or even will power to even walk at 90. HAHAHAHAHHAH, are you serious? or Naive to the max, its for his cronies suppliers dude! you old dog do anything for the country than everyday complain this complain that ? you think country owes you a living ? Foreign talents are not welcome in bolehland, be it as CEO or designer. Sad but true. Why all this contest from Proton? Improve your quality Proton, that is more important. Also, what happened to Najib’s promise to reduce car prices by 30%? Proton, being the liability of all Malaysians, should be first to start reducing their car prices by 30%. Najib sudah janji harga kereta akan turun. haritu macam ada orang complain, design proton teruk, suruh open to public. and now, proton dah open to public. 30% price reduction from najib is his BN’s manifesto. his own promise. personal interest. nak gain votes. kalau betul 30% reduction, semua kereta kena turun jugak, bukan proton saja, baik perodua, H atau T dan BMW. minyak ron 95 dah takde subsidy (kononnya), tapi 4 sen je kurang walaupun harga dunia minyak dah turun? aiyar your estima is worth less than 100k now. Bradder, be prepared.Next year car prices going up due to increase in excise duties n GST. Petronas is sending 37percent less in revenue to Gomen. Gomen short of cash next year? How to recover the shortfall? LHDN,KWSP,Excise duties,GST, and other forms of duties……BE VERY PREPARED.Low oil prices is a double edged sword.It is hurting the rakyat more. Mat Saleh dont pi$$ laa..
Proton just saved millions from doing a design themselves. Most car manufacturers spend millions just on design alone. So, Proton saved Millions, but gave first prize RM3000 and Macbook Air which is worth RM3000. There is a term quite similar: Makan Gaji Kosong. its just a contest and people already assume that P1 will build next car base on this.. aiya.. better copy paste bimmer, better what.. this is just to prove Msian also have gen-Y designer..
Walao eh! 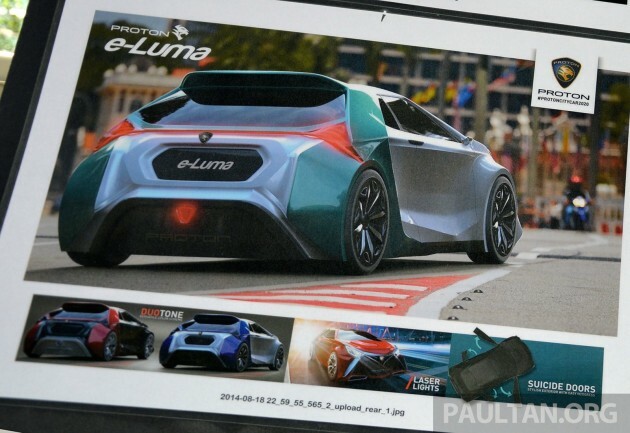 e-Luma design was superb! These two winners are the future for PROTON. I would agree if PROTON hire them one day..Go go PROTON! e-luma is the winner, or the malaysian student? 17 years old? i dont to sound sceptical but can he really do that? better than proton design team? There are two winners, one from each category and both Malaysian. Category 1 for entrants aged between 13 and 17 years old was won by Muhammed Amiruddin Abu Bakar, while Category 2 for entrants aged between 18 and 25 years old was won by Pow Ying Hern, who also won the Chairman’s Award. Proton still around in year 2020? Please enlighten us by entering the competition next time, okay? Sour grapes. You are just a fox. Proton had no choice but to run this contest. This is because the designers in Proton are a bunch of idiots, lazy, good for nothing and sitting doing nothing. Now, they got so many brilliant designs from the intelligent public. See, even the normal public out there got more brains then the fools working in Proton. Proton, the rakyat is fed up of your lazy workers. Even after 30 years of Government protecting you and making Proton the “only” choice of car in Malaysia, Proton can still fail to make money. For 30 years, MITI control other car prices. Told all other car players that they cannot price their cars near Proton pricing. And yet, Proton still cannot make money. How long must we Malaysians support a company that is sucking so much of money from us? Look at Hyundai, started just about 10 years earlier than Proton. See where Proton is and where Hyundai is? Hyundai is now the 4th largest car producer in terms of volume of sales. Honda and Toyota of the US is so scared of Hyundai as Hyundai ate a huge market share from them. Honda and Toyota shivver when they hear Hyundai name. Proton on the other hand, got no market globally at all. All the countries Proton attempted to penetrate, the Proton cars were rated the most dangerous car ever produced. And mind you, this is Export quality. Proton export quality is 100x more robust and higher quality than what Proton gives for the local Malaysian market. And yet, with this Export Quality, Proton can fail big time in every single market they tried to penetrate. I can only wonder what these countries will say if they were given the non export quality car for them to assess?? lol, its the hard truth my friend…proton is junk. So what if he speak the truth? Proton designer can’t handle “real world” truth??? Somemore your boss DrM only know how to mark up price to Rakyat pass 30 years, dare to competing without “after taxes” on CBU or CKD car price??? No no..i wont do that. What hes claim was true. Shud name proton e-rubish instead e-lumia wtf is that a phone name? It’s just a contest. Let’s leave it at that. Congrats to the winners. Err… what other prize did they get besides the trophy and t-shirts? Added in mention of the prizes in the story. Proton has taken billions of ringgit of our money over the years. Direct payment to them just to stay afloat. Proton has also deprived Malaysians billions of ringgit from investments that evetually went to Thailand. Proton also deprived Malaysians of hundreds of thousands of jobs from companies that went to Thailand to set up plants. And Proton give us RM5000 present? RM5000 is based on the winner’s effort. Did you invest in Proton ? Did you loan Proton money? You with little knowledge – Stop talking KOK ! Theophilus is better than the nanyang boy. Fully agree with u. But too bad this competition only open to kids. Apart from the e-Luma, the rest just like a kids drawing competition. What the F Proton limit the age group, I don’t understand. theo has yet to proof his talents designing a car from ground up. he is a master in rendering though. theo, you reading this? why not show proton a thing or two. Proton spends time and money on light subject like design competition while dodge real issues like sales figure. How many Iriz sold already? Not delivered yet? More like it will never be delivered. saw one iriz.. and axia less than 5 times.. so, will that show that axia sell better than iriz??? e-luma design is quite gud..
we should encourage more of this, syabas! why not offer him a job in Proton as car designer? we need top local talent to continue producing and design future protons. No fair, this guy is an expert in car design. the way i see it, there is someone behind him. an adult who could not participate the contest due to age restrictions. Designing a car that cost a bomb to materialize. Pow: Sorry guys, Singapore paid me better. design like sampah. they know nothing about a damn car. stupid imagination. what’s the point of this? do the design will ever going to be produced? hell no. the proton head design will never ever going to review this nubile design. he rather stick with his superior “in-house” donkeyshit crappy car design of his own. in short, this program is “wayang” only. u know whats the different between drawing and design??? u need ideas and computer skills i.e. CAD and few more.. bet u dunno what is CAD anyway..
u think they have the capability to put this into production?dream on! wow…look smart! congrats to the winners. Good job. Now let’s have an engine design contest so that Proton can have a family of decent powerhouses for its vehicles. And I feel bad for your opinion and English. what catches my eye is the exterior designs in pic 294387, 294383 and 294385. They are subtle, elegant and practical too. Small overhangs, low beltline.. epic for a citycar. Also blends well with Proton’s design language. Need some fix on the side profile though. Who cares if the kid draws with a pencil.. However I am quite disappointed since no one is trying to make single-spoke steering wheel with fixed centre.. a-la Citroen. That could allow a more optimized airbag system and ergonomics! For such an event, Proton can’t event give away an Iriz for the First price? No wonder those Macbook and iphones out of stock but the Iriz is stockpiling. Maybe they think giving away a bad design product for a good design competition doesn’t make sense. I entered the 13-17 years old category, but I didn’t even receive consolation prize. Mine might not be the most futuristic ones, but hey, do you really think our car will looks like spaceship in 6 years time? i could do better. if open to public la. i dare you proton. i know besides doing in visualization, there are critical economic sense in stylization, concepts, and aesthetics to be considered. yeah that bla bla also can be developed and goreng. hell yeah open to public see if your designer really know how to do things. i like to hear proton saying… challenge accepted. It WAS open to public you old fart. They only limited the age groups because those groups will be the ones actually buying the cars inspired from this competition. Proton wanted to see what the youths thinks and want in the future, not outdated or preconceived notions of “Design language” and “aesthetics” you old fart think as a good design. Haiz, I never stood a chance. Only in second semester of foundation year. Can only work with traditional media. Can’t compete with 3D renderings and professional layout design. Nvm, try again next time. Almost all of the design are hatchback cars. 1 is like supercar. Just wondering if this contest car was really in production, does this “Contest Designers” have some incentive? However overall, i like the design :) cheers! All you guys who thought the e-Luma put in a lot of hard work and effort… FOOLS. Designing is just one aspect of car manufacturing. I am sure all proton fanboys and girls,bashers alike prefer ” a total package ” rather than a cut and paste job. Now,even Paultan’s Gregory is complaining about the noisy,underperforming CVT gearbox. Might as well recruit these talented designers but sack the chief designer who designed the compressed/buttock banged Suprima-the ugliest car Proton ever produced. I wonder why these designers have no engineering sense when drawing? Look nice shape but absolutely non practical for production. Which is why one see Emas being displayed but end up with totally different car like iriz. this is very disappointing. cant believe such rendering deserved the 1st place. i mean like, wth..the design doesnt proportionate. the front fascia is like..too exaggerated and misplaced..the side profile summore..aiyooo…talking about the sculpted bodystyle?its oversculpted..as if a 5 year old toddler playing with playdoh…the drip line is misplaced….looks like hahahaha…judging panel is a joke…the way you chose the category 2 winners had shown how blind you are when looking at automotive design flair..
Haiya ape susah2 tak suka Proton tak payah beli la senang. here to share my entry. Really funny to see ppl complaint this and that!!! If so good, why dun compete with them or if u out of the age requirement, show us the artwork here for us to convince u r better than the winner!!! ..Duh.IMHO its just some slight modification, alteration of the Golf GTI Grant Taurismo design. !Not entirely a genuine ideas. Panel of judges lack awareness and oblivious of the GT Design.Haaha.